On the scuba diving scale of great diving, today would definitely push the pin to its breaking point. If the crystal-clear, blue water we had on both our dives wasn’t enough of a reward, we spent one of our dives interacting with a very special and popular fish that frequents one of the local reefs. He is affectionately known as Shadow. Why such a name? Well perhaps a photograph would tell it best. 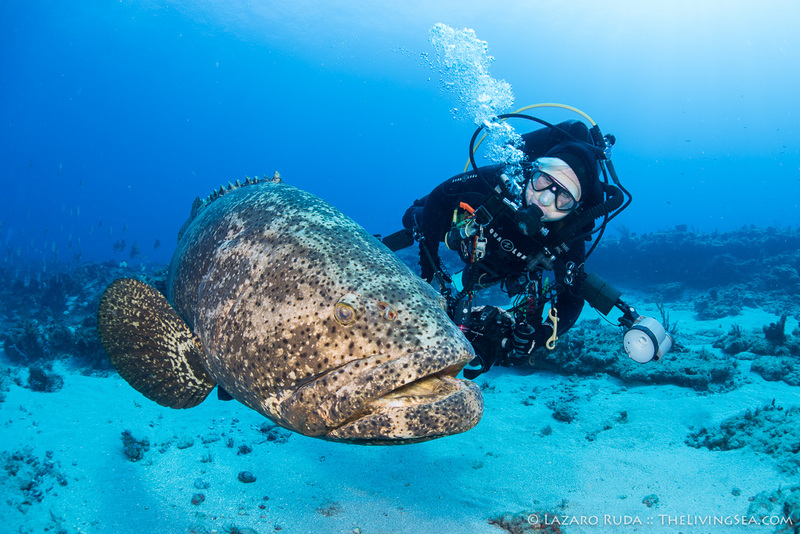 This gregarious 6-foot, 200lbs+ leviathan is a goliath grouper who seems to truly enjoy human company. He was named Shadow because that is usually where he spends his time — replacing your shadow on the ocean floor. Move in any direction and he will happily follow. He doesn’t play favorites either! If there are 10 divers hovering around him, he will be sure to stop and visit every single diver. For an underwater photographer this is heaven sent as getting close-up photographs of this wonderful creature couldn’t be any easier. If instead you are trying to get photographs of the stunning reef where he lives then you have a big challenge in your hands as he is quite the ham for the underwater camera and likes to appear in EVERY shot! 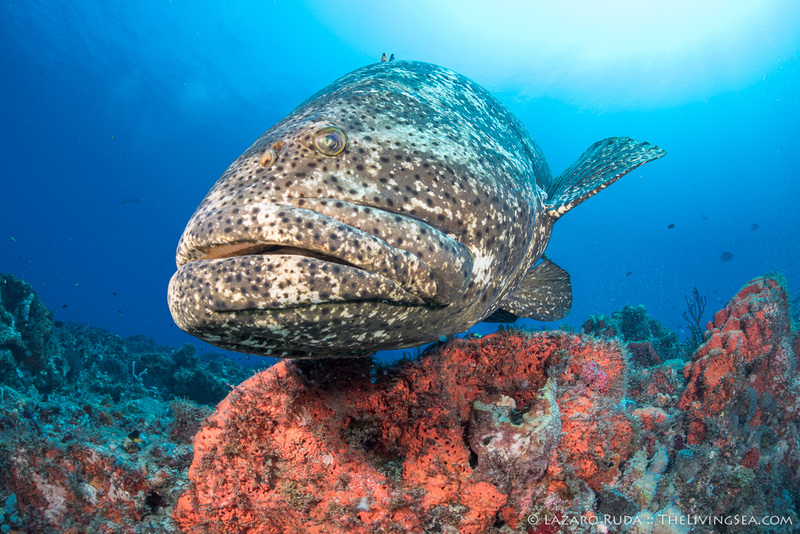 Shadow has been around this reef for quite some time and his popularity and unique behavior has attracted countless divers from around the world to visit this fascinating goliath grouper. Throughout the whole hour-long dive, Shadow, the goliath grouper, spent his time alongside the diver no matter how far north we drifted from his homebase. 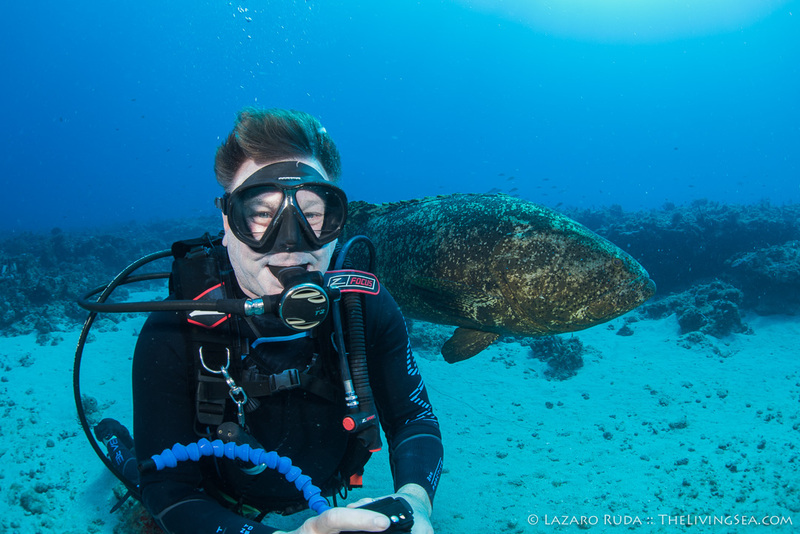 The divers were all wearing a smile getting the chance to have a closer encounter of the goliath grouper kind. This was only have the fun, though. 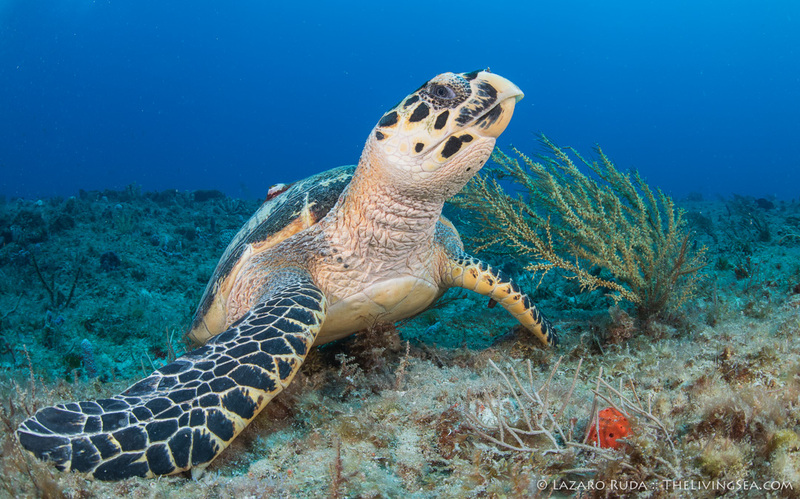 Our next dive site destination was Midreef, which is a favorite of the resident sea turtle biologists such as Dr. Larry Wood of the Florida Hawksbill Project. After a few minutes of cruising around this coral reef system, which consists of hills and valleys, we came across one of Larry Wood’s sea turtle (we know this by the flipper tags) munching away at some sponge on the reef. These sponges seem to be their favorite meal. Thankfully, Palm Beach, FL. has one of the largest sponge colonies you will ever see on any coral reef, so there is plenty for these sea turtles to eat. Approaching the end of our dive, we made one quick stop at Spearman’s Barge where we enjoyed swimming through swarms of fish. Conditions today were 70-80ft+ of crystal blue visibility, water temperatures in the mid 70s, and a light to moderate north current. Anyone know how to fix a broken scuba diving scale? We hope you enjoy the rest of today’s photos and you’ll consider joining us for some dives, too. If you’d like to visit Shadow, the goliath grouper, or have a chance encounter with one of Dr. Larry Wood’s hawksbill sea turtles, be sure to contact the captain and let him know.